I’m fan of the works of Weis and Hickman. I first found them in The Rose of the Prophet trilogy, and later read the Deathgate Cycle. They are also the autors of many of the Dragonlance books, although I have not read those. “Bones of the Dragon” is, in many ways, typical of a Weis and Hickman story. 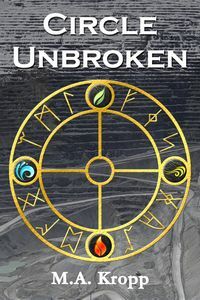 A young man, Skylan Ivorson, full of himself and over-confident because he feels he has been specially blessed by his tribes’ god of war, feels he should be Chief of Chiefs of all his people. His father knows Skylan is not ready in many ways for those responsibilities. When an enemy people arrive, claiming their new gods have defeated the gods of the Vindrasi, Skylan and many of his people don’t believe them. But the precious dragon statue, symbol of the special relationship of the Vindrasi with the dragon goddess, is broken, and the priestess cannot speak to the goddess. The only hope is for the Vindrasi to find the five dragonbones and bring the primal dragons back. As typical as this story may be, the strengths of Weis and Hickman’s writing are all there. Characters are engaging. I was at times frustrated, elated for, and ready to pummel Skylan as he searches not only for the dragonbones, but for himself as well. The setting is full and has depth, without being overwhelming. And the intersection of what (to me) seemed Norse-based legend for the Vindrasi and a Aztec/Mayan feel for the ogres was a nice variation on the use of mythology. This is the first book in the series, so the story is not fully told, but there is enough to make it a satisfying first installment. Characters change, the plot moves along mostly well, with a few slower spots, and there is enough left undone to lead on to part two. For fans of these two writers, this series will not disappoint.